I also benefit from carbohydrates in the diet. And while that may be sacrilegious coming from someone people consider to be a 'keto guy' (I'm not...), it's completely in line with what the evidence tells us. Namely, that everyone is different and some people respond to low, some to moderate, and some (not many...but some) to high carb diets. You can see what happened in Figure 1. You can see that my ketone levels dropped to around 0.2 mmol/L in the morning, rising to 0.7 mmol/L (or thereabouts) in the evening. So, functionally you could say that I was entering nutritional ketosis (i.e. 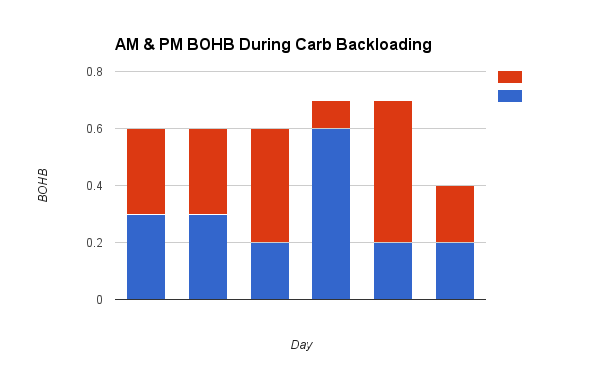 >0.5 mmol/L BOHB) over the course of the day, and then dropping out after having a high carb-load in the evening, and this repeated every day. I was only averaging around 2100 calories per day in this week. Of this around 48% of my calories were from fat, with 26% from protein and carbs respectively. Most days my eating would consist of a large protein and fat meal in the morning at around 9am, followed by a modified fast through the rest of the day until dinner at around 6pm, which also consisted of protein and fat and veggies predominantly. Now, I'm not suggesting that everyone will be able to perform at their best, nor lose maximal fat doing this... But they might...especially if this way of eating allows them to inadvertently find their appropriate macro split. and c) demonstrate that if you find a strategy that allows you to eat some of the foods you love, ad libitum, then you will be likely to stick to that, and achieve better results than any supposed 'perfect' diet. 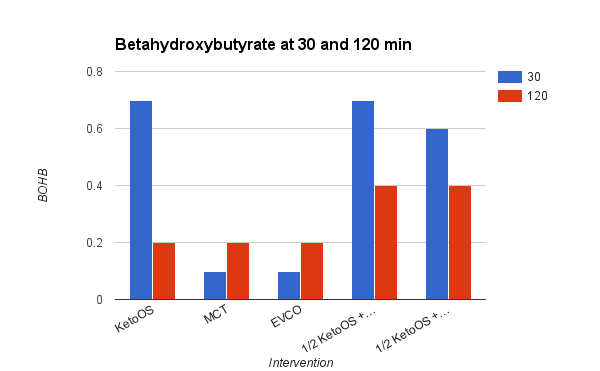 Hacking Ketones - N=1 experiments with Keto//OS, MCTs and more! Or/ the equivalent amount of MCT oil or Extra Virgin Coconut Oil. I took the product on rising, on an empty stomach and tested blood BOHB 30 min after ingestion and then again at 2 hours post-ingestion using an Abbot Freestyle Optium ketometer. After doing these first three days of testing I reversed the order of tests and did another one to check. The measures below are the average of the two days. You can see in the table below that the Keto//OS (unsurprisingly) resulted in a much greater initial rise in BOHB that quickly declined. To see if there was any advantage in combining Keto + MCT I upped the dose of MCT to 1 x Tbsp. and combined with a 1/2 sachet of Keto//OS (second from right) resulting in a similar rise in BOHB but a more sustained response. I also tried this with a (high) dose of protein (Nuzest Clean Lean Protein). The increase in BOHB was similar, with good residual results. So how did I feel? A full dose of Keto//OS worked really well. I felt clear, improved cognition, and increased satiety and much more so than either of the equivalent doses of MCT or EVCO. The full-dose Keto//OS did make my stomach just a little 'gripey', similar to the feeling from taking a dose of MCT oil that is fractionally too high. (Remember that this is very individual dependent). There was little difference in effect (for me) from taking a 1/2 serve of Keto//OS with 1 x Tbsp. of MCT. BUT - the best result for my mental clarity, cognition, satiety and overall feeling of wellbeing was from having a 1/2 dose of Keto//OS with 1 x Tbsp. MCT AND 40 g protein. I typically respond best to combining good fats with protein and I noticed that I was fuller for longer, even clearer mentally and had energy to burn. The other advantage of this strategy is that I can mix a batch up in the morning, with 1 x sachet Keto//OS, 80 g protein, and 2 x Tbsp. of MCT oil, drink one serve in the morning, and then another early afternoon, and that pretty much gets me through the day. I'm going to experiment with other dosing strategies. What have you found works best for you?